Having a large waist is an important early warning sign for diabetes, one that in some cases may be just as significant as body mass index (BMI), if not more so, a new study has found. Waist size, which provides a rough measure of a person's body type, may be especially useful for identifying high-risk people who are overweight but not obese, the study suggests. Obesity is a clear-cut risk factor for diabetes, but doctors generally have a harder time determining which overweight people are most vulnerable to the condition. 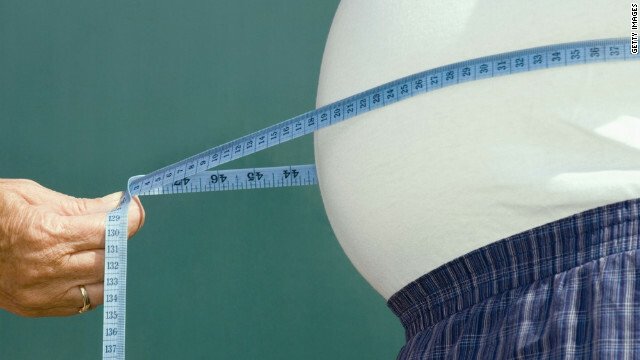 "Waist circumference is very helpful in people who are obese, but exceptionally helpful in people who are overweight," says Dr. Abraham Thomas, M.D., head of endocrinology and diabetes at Henry Ford Hospital, in Detroit. Thomas was not involved in the study. Researchers at Addenbrooke's Hospital, in the UK, measured the waist size and BMI of about 30,000 middle-aged Europeans and followed them for up to 17 years. People who at the start of the study were merely overweight but also had a large waist - defined as 40 inches for a man and 35 inches for a woman - were more likely than obese people with normal or moderately large waists to develop type 2 diabetes, the researchers found. At the 10-year mark, 7% and 4.4% of overweight men and women with large waists had developed diabetes, respectively. By contrast, the corresponding figures among obese men and women with moderately large waists were just 4.9% and 2.7%. Among women, in fact, waist size appeared to be even more useful than BMI for predicting diabetes. When the researchers analyzed the three-way links between diabetes, waist size, and BMI, they found that diabetes risk was more closely associated with waist size than with BMI. Waist circumference, on the other hand, measures belly fat and indicates how fat is distributed across the body. This is important information, since people who tend to accumulate fat around their belly (as opposed to their hips and legs) are more likely to develop not only diabetes but also heart disease, a common complication of diabetes. "The visceral fat that surrounds the organs and intestines in the abdomen produces a lot of hormones, which have implications for making the body resistant to insulin and can contribute to inflammation," Thomas says. The new study, which appears in the journal PLoS Medicine, is the latest to highlight the importance of waist size and the shortcomings of BMI. If doctors looked at waist size more closely, they could refer more high-risk individuals to weight-loss and diabetes-prevention programs, the study authors say. But rather than supplanting BMI as the best predictor of diabetes risk, waist circumference might be most useful if it's simply added to the mix, says Jane Bolin, Ph.D., an associate professor of health policy and management at the Texas A&M Health Science Center School of Rural Public Health, in College Station. "It's another indicator physicians can rely on to raise red flags about the possibility of diabetes," she says. A potential hurdle, however, is that measuring waist circumference isn't as easy as it sounds. Waist measurements need to be taken consistently at a certain place on the torso in order to be accurate and useful, and most nurses and doctors aren't trained in how to do this, Thomas says. The study, though the largest of its kind, has some limitations that will need to be addressed in the future, the authors say. The participants were European and overwhelmingly white, for instance, so other studies will be needed to confirm the link between waist size and diabetes in people of other ethnic backgrounds. At least this speech wasn’t made in secret. I donate to Bernie weekly. If he isn’t the Democrat’s candidate I might have to vote for Mr. Trump. I mean, Merrick Garland?! Really?! Thanks for some other great article. The place else could anybody get that type of information in such a perfect approach of writing? I have a presentation subsequent week, and I am on the look for such information. I would like to show some appreciation to this writer for bailing me out of this particular matter. Because of looking out through the internet and getting notions which are not helpful, I was thinking my life was gone. Existing without the presence of strategies to the difficulties you've resolved by means of your report is a critical case, and the kind that might have negatively affected my entire career if I had not noticed your web page. Your main capability and kindness in handling the whole thing was helpful. I'm not sure what I would've done if I hadn't come upon such a stuff like this. I am able to at this time relish my future. Thanks for your time very much for the expert and amazing help. I won't be reluctant to propose your site to anyone who would like care on this matter.